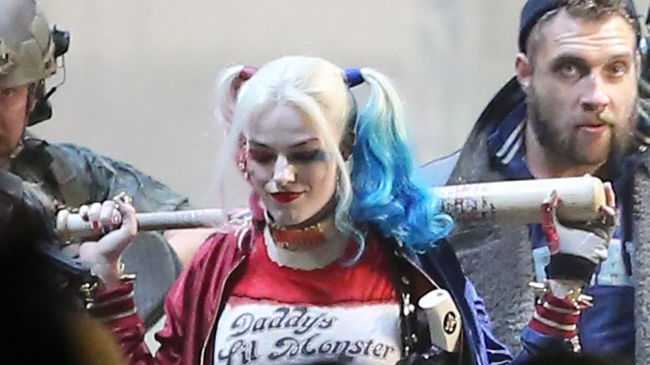 MARGOT Robbie fell out of a helicopter whilst making 'Suicide Squad'. The 26-year-old actress plays supervillain Harley Quinn in the DC Comics anti-hero blockbuster, a role that required her to carry out numerous stunts and fight scenes in high heels and hot pants. Margot managed to master her moves in the skyscraper shoes but she did fall out of a chopper one day which left her bruised. During an interview with her cast mates on 'Good Morning America', she shared: "I'm not good in heels in the first place so I was a little nervous but we got through it. I didn't fall over, but I fell out of the helicopter, everyone remembers that one!" Despite sounding quite dramatic 'The Legend of Tarzan' star insisted she only suffered a "couple of bumps and bruises". Harley is a crazed former psychiatrist and the on/off girlfriend of The Joker - played by Jared Leto in the film. Margot is joined in the special ops team - which is put together by a secret US government agency - by Will Smith as expert marksman Deadshot and it is the second time they have acted together after appearing in comedy crime drama 'Focus' opposite one another. The Australian blonde beauty revealed she was responsible for convincing Will, 47, to learn to swim after discovering he couldn't on the set of the 2015 film. Margot was asked by the 'GMA' hosts to reveal a secret about her co-star and she said: "When we first met Will didn't know how to swim. I was insistent that he get in a pool. He did lessons." Will, who was also on the show, defended himself explaining there was much call for swimming in Philadelphia where he grew up. Will said: "Up in the city of Philly there wasn't a lot of swimming pools."